Food demonstrations and tasting opportunities are held throughout the Fest, and you’ll be able to discuss recipes and techniques with some of the areas finest cooks. To give you a sample of some of the treats you may encounter during the Fest, below are four favorite Nordic Fest recipes. Enjoy! Will make about 8 lefse. Boil potatoes in salted water, drain, mash, then rice. Add butter and the cream. Mix and cool. Just before rolling, add flour, sugar, and salt. Mix by hand or with a hand mixer. 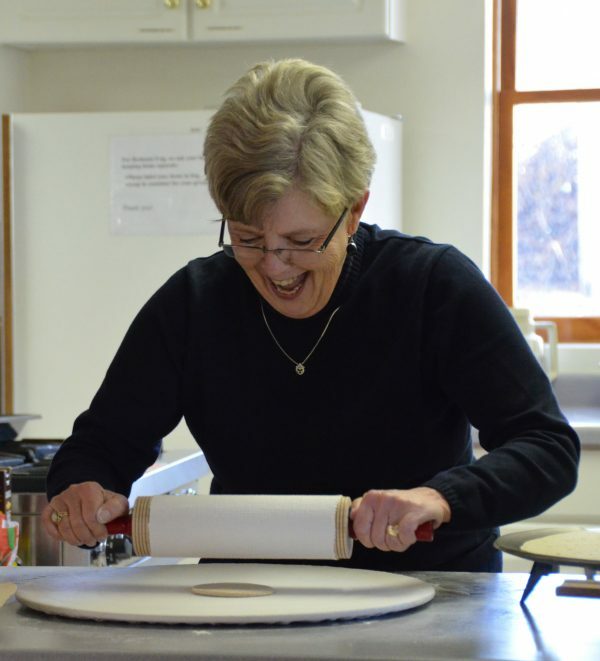 Roll thin using a cloth covered pastry board and lefse rolling pin. Bake on hot grill, turning once. Grind almonds in blender (fine). Mix with powdered sugar. Beat egg whites and fold them into dough. Roll out like pencil and put into Kranskake ring pans. Bake 20 minutes at 300 degrees. Cool slightly before removing. 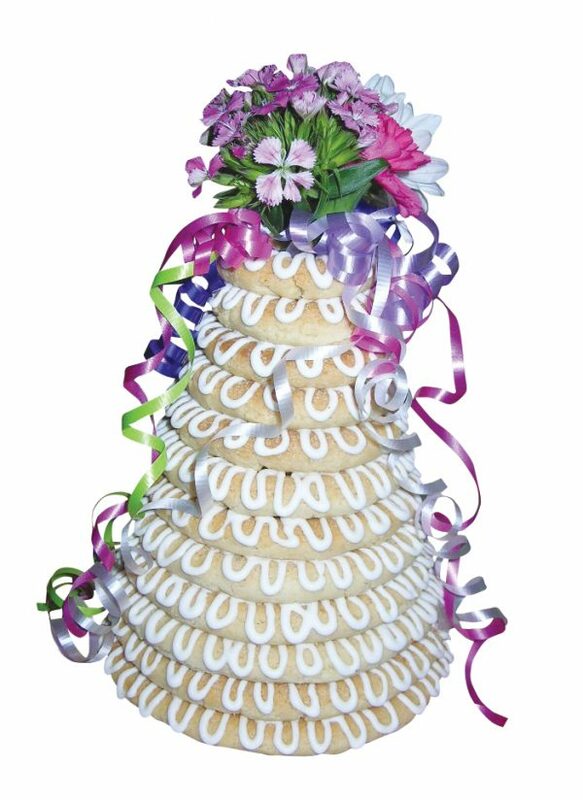 Use the frosting to hold the rings together. Use the remaining frosting to drizzle or frost the completed cake. Sour cream porridge with dried meats was festive food in the olden days and is still considered that today. 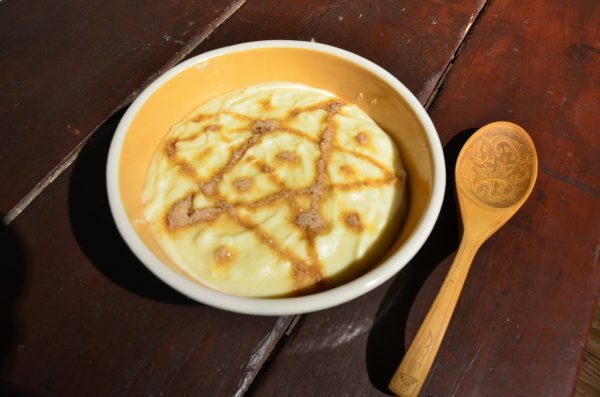 Sour cream porridge must be made from high fat (35%) natural sour cream, with no stabilizers or gelatin added. For the best results, use homemade sour cream. Heat 2 1/2 dl (1 cup) whipping cream to 35 C (95 F), almost body temperature,then whisk in 2 tablespoons buttermilk. Let stand at room temperature at least8 hours, until thickened. Sift over the remaining flour and bring to a boil. Bring the milk to a boil and thin the porridge to desired consistency. Whisk until smooth. Simmer about 10 minutes, and season with salt. Serve with the fat, sugar and cinnamon. Pour the cream into a very heavy 3 to 4 quart saucepan. Bring to a boil over medium heat and simmer x 10 minutes, stirring constantly. Stir in ¼ cup of the flour, beating with a whisk to keep the mixture smooth. Whisk in the next ¼ cup of flour. Using a wooden spoon continue to stir the batter which will be quite thick and must be stirred constantly throughout the whole process of cooking . Continue to cook and stir until the butterfat separates from the paste. Pour off the butterfat into a small serving dish and keep warm (about ¼ cup). Slowly beat or whisk in the milk slowly with the salt, and 2 tablespoons sugar. Bring to a boil, stirring constantly, and beat until smooth and thickened. Stir together the cinnamon and l/2 cup sugar. Serve with hot butter drippings and sugar and cinnamon.